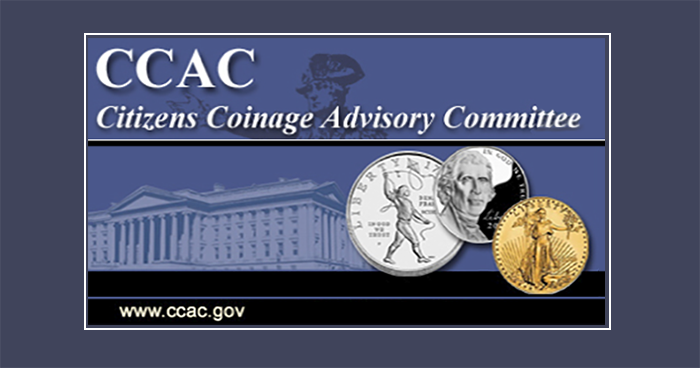 Pursuant to United States Code, the United States Mint is accepting applications for appointment to the Citizens Coinage Advisory Committee (CCAC) as a member specially qualified by virtue of his or her experience in American history. For further information, please contact Betty Birdsong, Acting United States Mint Liaison to the CCAC, 801 9th Street NW, Washington, DC 20220, or call 202-354-7770. Advise the Secretary of the Treasury on any theme or design proposals relating to circulating coinage, bullion coinage, Congressional Gold Medals, and national and other medals produced by the United States Mint. Advise the Secretary of the Treasury with regard to the events, persons, or places that the CCAC recommends to be commemorated by the issuance of commemorative coins in each of the five calendar years succeeding the year in which a commemorative coin designation is made. Make recommendations with respect to the mintage level for any commemorative coin recommended. Members are appointed for a term of four years. No individual may be appointed to the CCAC while serving as an officer or employee of the Federal Government. The CCAC is subject to the direction of the Secretary of the Treasury. Meetings of the CCAC are open to the public and are held approximately four to six times per year. The United States Mint is responsible for providing the necessary support, technical services, and advice to the CCAC. CCAC members are not paid for their time or services, but, consistent with Federal Travel Regulations, members are reimbursed for their travel and lodging expenses to attend meetings. Members are Special Government Employees and are subject to the Standards of Ethical Conduct for Employees of the Executive Branch (5 CFR part 2653). The United States Mint will review all submissions and will forward its recommendations to the Secretary of the Treasury for appointment consideration. Candidates should include specific skills, abilities, talents, and credentials to support their applications. The United States Mint is interested in candidates who in addition to their experience in American history, have demonstrated interest and a commitment to actively participate in meetings and activities, and a demonstrated understanding of the role of the CCAC and the obligations of a Special Government Employee; possess demonstrated leadership skills in their fields of expertise or discipline; possess a demonstrated desire for public service and have a history of honorable professional and personal conduct, as well as successful standing in their communities; and who are free of professional, political, or financial interests that could negatively affect their ability to provide impartial advice. Application Deadline: Friday, August 24, 2018.
or by mail to the United States Mint, 801 9th Street NW, Washington, DC 20220; Attn: Greg Weinman. Submissions must be postmarked no later than Friday, August 24, 2018. First-class mail to the United States Mint is put through an irradiation process to protect against biological contamination. Support materials put through this process may suffer irreversible damage. We encourage you to consider using alternate delivery services, especially when sending time-sensitive material.